The HORIBA STARS Brake Application Suites consist of ‘ready-to-go’ test procedure(s) according to the relevant brake test specifications. The suites include any STARS resource which is required to run the test immediately e.g. test schedules, data loggers, display pages, limit sets and much more. The measuring data will be stored in STARS data format, as numerical DIAdem® sheets (Full Sheet) and as a standard test report or complete National Instruments DIAdem® based data evaluation. The HORIBA Brake Application Suites include a full range of public standards for brake testing for hydraulic and pneumatic actuated disc and drum brakes. They contain performance tests as well as NVH procedures of passenger car brakes and light to heavy duty truck brakes. Additionally, HORIBA provides more than 50 application suites of well-known, global OEMs. The combination of an approved STARS Brake test procedure and a specific DIAdem® Evaluation Script builds a very powerful, easy to understand and simply to use toolbox for any kind of brake test. 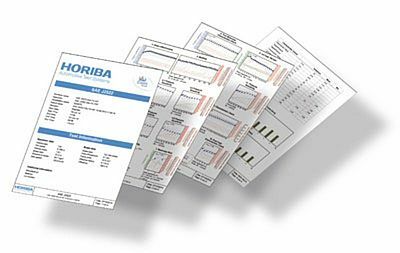 If a test procedure defines no specific data evaluation, the HORIBA Brake application comes with the dedicated HORIBA standard DIAdem® test report. From performing a test including the corresponding data acquisition to the point of result evaluation and visualization, the HORIBA Brake Application Suites are an easy way to perform your brake testing in the future. Note: Distribution of the Application Suites and data evaluations scripts based on specific automotive industry standards requires the permission from the owner of the relevant regulation. DIAdem® is a registered Trademark of National Instruments Inc. USA.